Flower girls can be such a great addition to the wedding party. 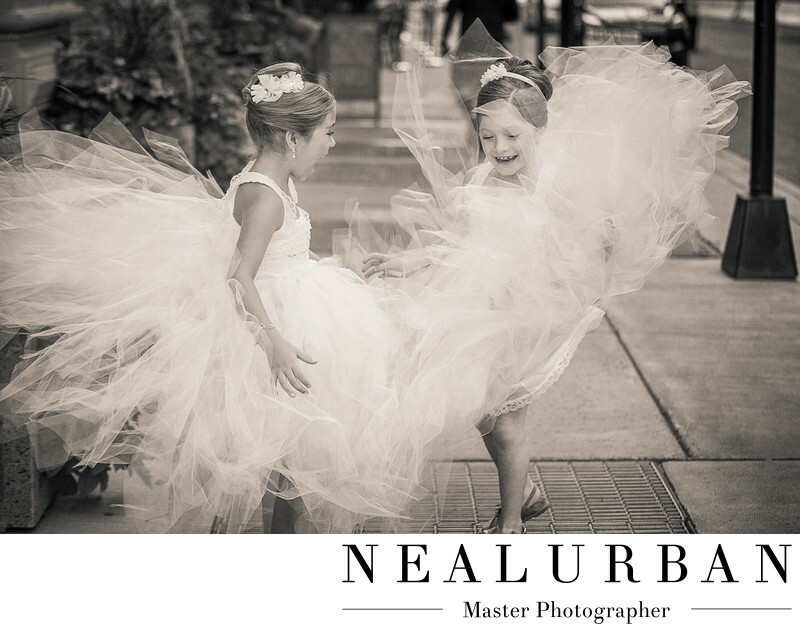 These two little girls had such a great time and loved being in photos. One of the flower girls was actually the daughter to one of the brides. It was a gay wedding and both woman were absolutely breath taking. The other flower girl was a cousin.We wanted to do something fun with the little girls for them. They have a super close family and we wanted to show that. The getting ready, ceremony, photos, and reception were all held at Hotel at the Lafayette in downtown Buffalo. After the ceremony, we headed right outside to do some quick family portraits. During some of the photos, we heard the flower girls laughing around the corner. We looked over and saw them standing on one of the air grates in the side walk. We had to take a time out from the family portraits. The flower girls were having so much fun. They had huge fluffy dresses. The dresses were blowing around like crazy. They were screaming and laughing and having the best time together. It was so cute! There was a definitely that Marilyn Monroe vibe and inspiration for this image! Neal decided to turn it to black and white. It helped to make the image more timeless! Location: 391 Washington St. Buffalo, NY 14203 United States.